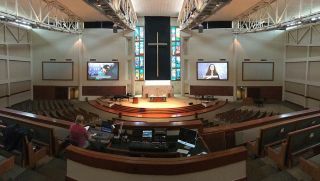 Founded in the middle of the last century, Concordia Lutheran Church, in San Antonio, TX, has grown to become one of the denomination’s largest congregations nationwide. Located on a nearly 50-acre complex, the church now has more than 6,000 members. Not surprisingly, the church’s worship-technology needs have expanded with the congregation. The problem was a common one: Concordia Lutheran was growing into the 21st century using 20th-century technology. That was addressed late last year when AV systems integrator and live-event producer Inspirmedia Productions installed a Roland OHRCA M-5000 Live Mixing Console, the hub of a new audio-management system that also includes the Roland M-200i 32-channel mixer, Roland M-48 live personal mixer, and Roland R-1000 48-Track Recorder/Player, all using the Roland Ethernet Audio Communication (REAC) protocol, and all linked through Dante networking. Since then, the church’s large audio input counts from the stage and other sources have become far easier and more reliable to manage.